Hamilton Princess & Beach Club, A Fairmont Managed Hotel is located just steps from Bermuda’s most popular restaurants, shops, and attractions. 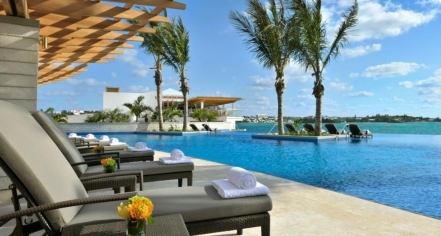 The resort provides guests with the latest in amenities and activities for a great experience while visiting Bermuda. A spa, health club facility, resort pool, hot tub, dining, and activities are just some of what Hamilton Princess & Beach Club has on premises. Live music and entertainment are available at both Marcus’ and Crown & Anchor. As part of the recent $100 million-dollar renovation, Hamilton Princess & Beach Club presents modern art throughout the lobby and public spaces, featuring works by Andy Warhol, Nelson Mandela, Damien Hurst, and Banksy. Guided walking tours are available. Those who enjoy golfing will be happy to find that Bermuda is famous for having more golf courses per capita than any other place in the world, with several within a 25-minute ride of the Hamilton Princess & Beach Club. Guests can have the time of their lives with K. S. WaterSports, located at the Hamilton Princess & Beach Club Marina, and enjoy a selection of Jet Ski tours, pontoon rentals, parasailing, kayaks, and other watercraft. For guests conducting business, there is an ATM on premises and the concierge is available for assistance with business services.